Remove the stone from an avocado. Scoop out a little more avocado to increase the size of the stone’s crater. Crack an egg into the crater. Sprinkle with Cayenne pepper (cheese too if you desire). Bake in the oven at 225 degrees until egg is cooked to the level you like. Don’t rush – this takes time. – but it is worth the time. Another Version: If you enjoyed this – try this fancier version that showed up on Yahoo. And Another Variation: This one is my Favorite for a Sunday Brunch. Put a couple of tablespoons of Brushetta mix (Hannah brand at Costco) in an individual oven pan to make a base for the Avocado. Scoop out a really ripe avocado and nestle it in the mix. 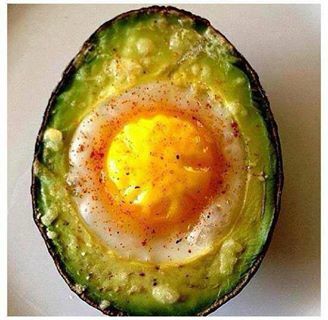 Crack an egg in the half avocado. The Brushetta will “catch” any white that runs off the Avocado. Bake for about 1/2 hour. When the Yolk firms up, sprinkle shredded Parmigiano-Reggiano or Mexican cheese mix on the egg and surrounding Brushetta. 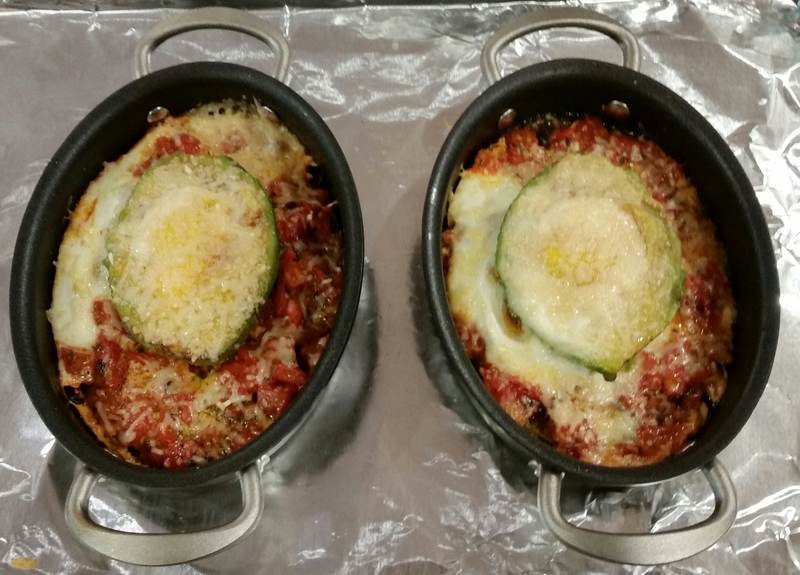 Put back in the oven until the cheese melts. Sprinkle with crushed red pepper if you like it really spicy. 8-31-14: I finally took a picture of the way I make it for breakfast. How was that? I have just recently started eating avocado’s after not caring for them…not sure I could eat one like that! Very good for you tho! It actually tasted pretty good. My wife – who is not a big fan of Avocados – enjoyed it. Needed a bit more spice. I did put a Mexican shredded cheese mix on top during the last couple of minute of cooking. I took it out after the egg white was fully set but the yolk was soft. Almost like having a soft boiled egg in an egg cup. A tray of these as part of a company brunch would be a wow.